The new Siemens SWT-7.0-154 Offshore wind turbine is currently being tested in Østerild, Denmark. Siemens has received its first order for the new 7 MW offshore wind turbine: the company is to supply, install and commission 47 direct drive wind turbines, each with a rotor diameter of 154 m.
The wind turbines will be deployed in the Walney Extension East project in the Irish Sea. The developer and owner of the offshore wind power plant is Dong Energy. This order is part of the frame agreement concluded between Dong Energy and Siemens in 2012. The capacity of Walney Extension East will be sufficient to supply more than 230,000 British homes with clean energy. Service for the plant will be provided jointly by Siemens and Dong Energy for a period of five years. The improved version has stronger permanent magnets, optimised generator segments and upgraded converter and transformer units. Walney Extension East will be erected off the British west coast in the Irish Sea, approximately 19 km from shore. Installation of the turbines is expected to start at the beginning of 2018. The project is situated next to the Walney 1 and 2 offshore wind power plants, each equipped with 51 Siemens wind turbines with an output of 3.6 megawatts each. 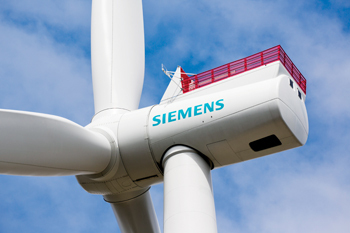 Siemens has already installed more than 5.8 gigawatts of offshore wind power capacity worldwide, with two gigawatts commissioned in the last fiscal year alone.